With the Copernicus Sentinel-3A satellite fully fledged and its data freely available, the task of monitoring and understanding our changing planet has been made that much easier. Seeing the effect spring has on our plant life is just one of its many uses. Launched in February 2016 and carrying a suite of instruments, Sentinel-3 is the most complex of all the Sentinel missions. 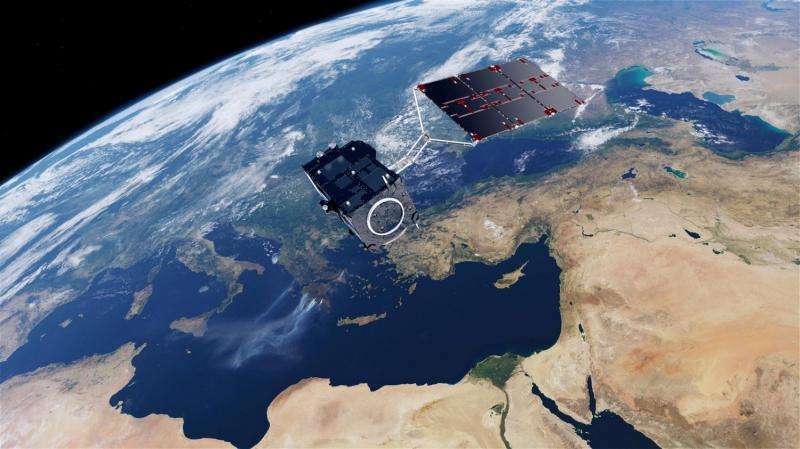 As the workhorse mission for Europe's environmental monitoring Copernicus programme, it measures Earth's oceans, land, ice and atmosphere systematically so that large-scale global changes can be monitored and understood. While Sentinel-3 offers this 'big picture', it can also be used to monitor smaller-scale environmental issues such as urban heat islands. Sentinel-3 is well on the way to being at the heart of operational oceanography, but it also provides unique and timely information about changing land cover and vegetation health. For instance, the animation above uses information from the satellite's ocean and land colour instrument to measure changing amounts of chlorophyll in plants. Here we clearly see the progress of spring greening in the northern hemisphere, for example. Since its initial commissioning, when the satellite and instruments were meticulously fine-tuned, Sentinel-3A has been in a 'ramp up' phase. This means that over the last year, while the satellite was being prepared for its life as a fully operational mission, only 'direct instrument' data were available. Another step in the processing chain is needed to translate them into more tangible information for users worldwide. This milestone has now been passed so that the best quality data possible are now freely available from the satellite's ocean and land colour instrument and from the sea and land surface temperature sensor, which measures energy radiating from Earth's surface. This level of data from its other instrument – a radar altimeter, which measures the height of the sea surface, rivers, lakes and land – have been available since last December. ESA's Sentinel-3 mission manager, Susanne Mecklenburg, explained, "Sentinel-3 is an extremely complex mission, and I'm very proud to say that it's delivering on its promise. "We have been working closely with our colleagues at Eumetsat to make sure it is ready to deliver top-quality data. This is important because while Eumetsat operates the satellite, both organisations manage the mission together. "ESA is responsible for the land data products and Eumetsat for the marine products – all of which are made available for the Copernicus services and other users. "Measurements made by the satellite's colour instrument over land now offer users key information to monitor the health of our vegetation, which is essential for agricultural practices, and to help plan resources. "This also complements other missions such as the Copernicus Sentinel-2 and Proba-V. Together, they will be a powerful tool to map our changing lands." Sentinel-3 shows how Earth's surface temperature changes, which is also important for weather forecasting and for monitoring climate change. Over land, measurements can be used for urban planning, for example. Later in the year, data products will also be available for monitoring fires.